Even when I was just a wee Asian-American tadpole who could barely reach the toilet flusher, I knew almost every popular Chinese-mart snack by heart. Not that I actually knew how to read their labels, mind you (yes, sadly, Chinese school bored me to literal tears– I always resisted going! ), but I knew how the brightly colored, garish plastic packages of joy looked: from the invitingly translucent wrappers of tart plum candies to the glossy, irresistibly pink boxes of strawberry Pocky. 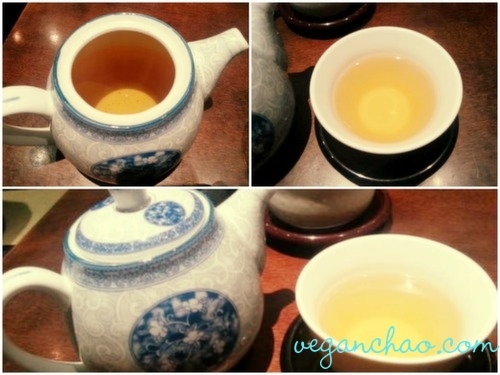 Of course, those snacks are now well out of my vegan repertoire, since almost 99.99999% of them contain milk, eggs, fish, albumen (egg whites), or other no-no ingredients (Sachima… sniffle…). Among the hundreds of snacks I’ve had to cross off my lists was a certain type of crunchy peanut snack that contained squid, manufactured by Kasugai. My Chinese-supermarket-going readers will know exactly what I’m referring to. If not, see the picture below. Why… oh WHY does it have to have SQUID in it?? My life just hasn’t been the same since I’ve had to abstain from my favorite Kasugai treat. UNTIL *drumroll please* a kind angel of munchies (a.k.a. a fellow coworker) brought back a similar snack called Mani Moto from Colombia. Each Mani Moto pack comes pumped full of air and is realllly tightly sealed– I’m guessing so the nuts inside are insured against crackage. Great for smuggling in your luggage! 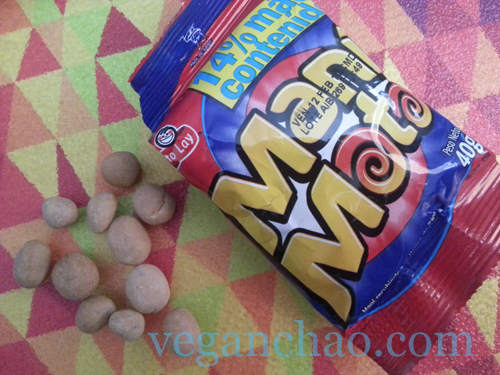 Mani Moto is a peanut snack, manufactured by Frito Lay/PepsiCo, that is remotely similar to the Kasugai squid peanut snack of yore. In fact, you could probably call it the Kasugai peanut snack’s Hispanic cousin. Like the Kasugai peanut, Frito Lay’s version has an outer crunchy-hard shell made from flour, except that it is totally vegan. Inside the amply hard shell is a single roasted peanut. 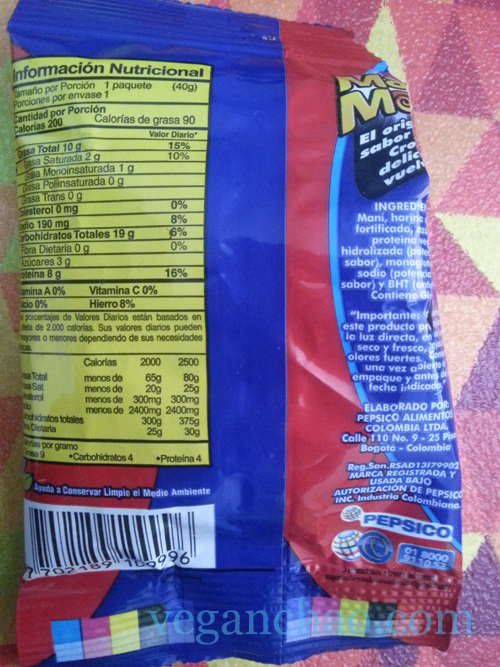 Featuring the colors of the Colombian flag, Mani Moto’s red, blue and yellow wrapper conceals a satisfying treat. 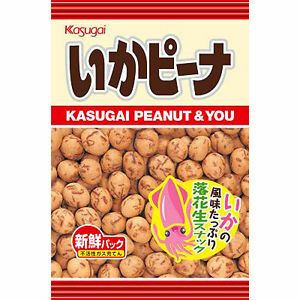 The peanut inside is roasted and there are no frills like Kasugai’s peanuts have (with seaweed and sea creature), but that doesn’t make it any less satisfying. Consistency-wise, Mani Moto does seem harder to crunch on and devour, so I don’t recommend giving it to your denture-clad grandpappy or 3-year old nephew. 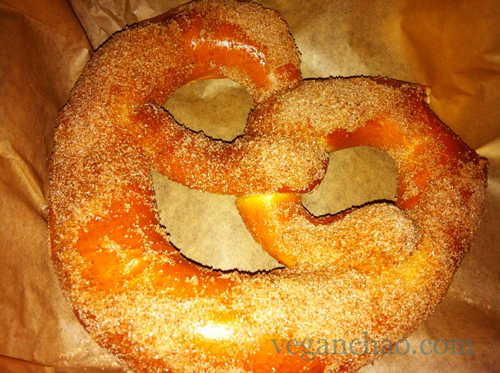 But it makes for an ideal in-between meals munchy, or with an ice-cold beer instead of straight-up nuts. 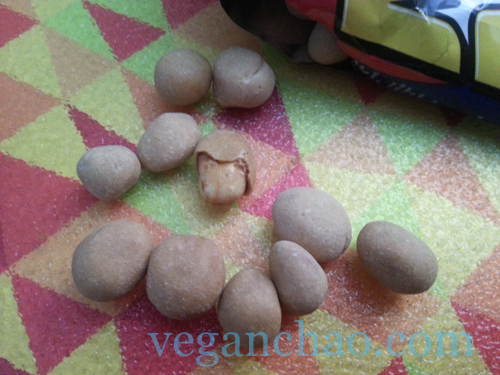 Mani Moto peanuts are 100% vegan. At long last, my high school Spanish lessons were put to good use! The only drawback? They’re from Colombia. I guess I’ll just have to wait until my coworker decides to make another trip… until then, I’m gonna just have to dream about my next Mani Moto fix. 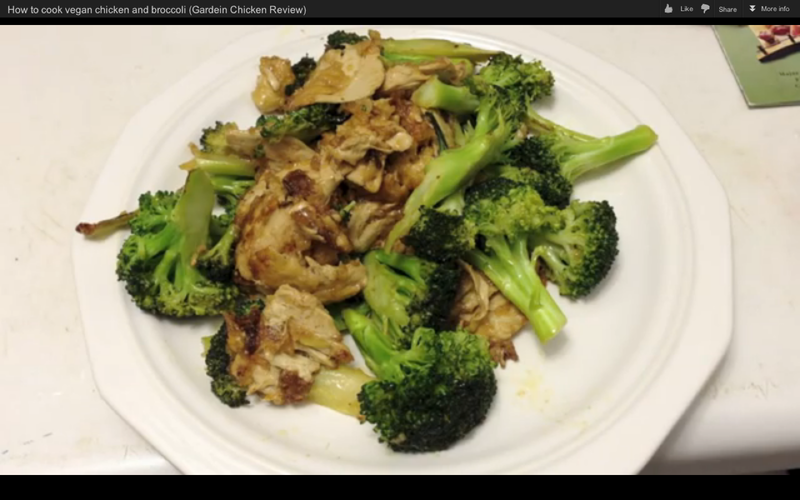 Gardein Chicken & Broccoli – Dinner is Served!